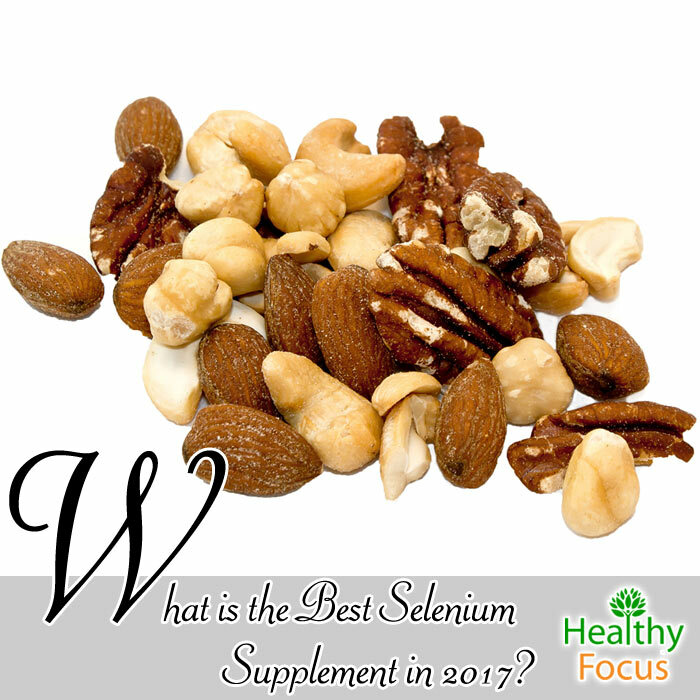 What is the Best Selenium Supplement in 2018? Selenium is a trace element that your body needs in small amounts. The mineral occurs naturally in certain foods such as sunflower seeds, Brazil nuts , eggs, tuna, liver, red meat and poultry. Although we only need small amounts of the mineral, it is still important for the human body to maintain good health. In this article, I will tell you how selenium can benefit your health and then take a look at the best selenium supplements on the market today. With any luck, it will help you decide whether you need a selenium supplement and if you do – which one to choose. The body is one of those important minerals that the body is unable to produce itself. It is therefore important that you get enough of the mineral through your daily diet or by supplemental means. Once selenium has been ingested, the mineral combines with certain amino acids and plays a variety of important roles in the human body. Selenium can benefit the body in a variety of ways because of its antioxidant and antimicrobial properties as well as its ability to boost the immune system. Selenium has long been linked to thyroid health and fertility but studies suggest that getting enough selenium has various other benefits too. Estimates indicate that up to 20 million people in the US alone suffer from some sort of thyroid disorder. Research has demonstrated that selenium can help increase the production of the thyroid hormone and also reduce the risk of thyroid disease. Studies have shown that selenium has natural anti-viral actions that could prove useful in fighting a range of viral conditions from the common cold to far more serious illnesses. Studies indicate that supplementary selenium may be useful as a complementary treatment but not as the main remedy. Selenium is essential for healthy and efficient brain function as well as promoting good nervous system health. Studie have demonstrated that selenium helped protect the brain from decline. As we have already mentioned, selenium does occur naturally in certain plant and animal foods. Provided your diet incorporates sufficient amount of selenium, then the chances are you do not need supplementation. Studies suggest that selenium is only really beneficial for people who are deficient and has minimal effect on those who consume enough of the mineral. So how much selenium does a person need to ensure good health? There is some argument among experts over the recommended daily dose of selenium. Some experts suggest that any more than 55 mcg each day can cause a toxic effect while others say you should consume no more than 200 mcg a day. Before taking any supplement including selenium, make sure that you speak with a doctor who can give you the best advice. This is even more important if you have any ongoing health conditions, are pregnant, nursing or taking some type of prescription medication. What are the Best Selenium Supplements? Once you have decided that you need to take a supplement, the process of shopping for the right one can be extremely daunting. We have identified five of the very best selenium supplements available today and will take a look at their relative merits. Hopefully this will allow you to make a better choice when making your purchase. We feel that these selenium supplements from Thorne Research are worthy of making the list. They are made in the USA by a company with a strong reputation. The manufacturer also claims that this supplements is made only from the most pure source. You are definitely paying for quality here, but in the world of supplements you generally get what you pay for and these are the most expensive selenium supplements on the list. These supplements come with 200 mcg of selenium on each of the 60 capsules. They are very pure and 100% natural. They are suitable for vegans and vegetarians. They are independently tested for quality. These supplements have been well reviewed in general with most users claiming they had a positive effect. They are more expensive than the other selenium supplements on our list. Not everybody was happy with the effects. Bronson’s selenium supplements are also made by a well-established company with a reputation for quality. These selenium supplements are laboratory tested to guarantee purity and quality. This product also represents good value for money and is lower in cost per capsule than any of the others on our list. A container comes with 250 capsules in doses of 200 mcg of selenium. Most of the reviews from users are positive but a small minority have reported minor adverse side effect like stomach ache. They are also not suitable for vegetarians because the capsules include gelatin. There are 250 capsules in each container and they are very easy to consume. They are FDA and GMP approved. These supplements contain gelatin and are not suitable for vegans and vegetarians. Some users have report a stomach upset after using them. These selenium supplements from LFI Labs also supply you with 200 mcg of high quality selenium. A container comes with 100 capsules that are easy to get down and have been NSF certified. They are also suitable for vegans and vegetarians. The vast majority of customers are happy with this product but if you are still nervous, LFI Labs also offers a money back guarantee. The 200 mcg of selnium is delivered in convenient and easy to consume capsules. Approved by the FDA and the GMP. The only con is the high price of the product. Amazing Formulas are a well-respected company known for their superior quality at very affordable prices. Their selenium supplements are certainly no exception. They have been laboratory tested to ensure purity and are made of 100% natural ingredients. The 240 tablets in each container are very small and easy to get down, they are also suitable for the vegetarians and vegans among you. The 200 mcg dose of selenium is delivered in small, easily swallowed tablets. There are 240 tablets in each container. They are natural and have been tested for purity. They are free of soy and dairy and suitable for vegans. They contain gluten which many people can not tolerate. They have an unpleasant smell. NOW Foods are a company who have developed an excellent reputation after 50 years in the industry. Their selenium supplements are delivered in the form of capsules which are suitable for the vegans and strict vegetarians among you. Most user reviews are very positive but some reported that they did not feel any positive effects and a small minority reported minor side effects. The capsules are easy to get down and each container has 180 capsules with a 200 mcg dose of selenium. Some users were disappointed with the lack of positive effect. Some users have reported an upset stomach after use.